Hello, Monday! It’s not a sunny day over here in Jesselton, North Borneo – A cloudy Monday morning. As I tune into Hitz.FM, and browsing the Internet to gather some information for my works, I stumbled upon this kawaii blogger who writes about playing this ‘once-so-famous’ digital pet. Do you still remember the famous egg-shaped game which you couldn’t live without back then? It was very famous in the 90s where almost everyone would bring to school to make sure their digital pets were given enough pamper? I wasn’t part of the trend as my parents didn’t allow me to spend time on it (they would prefer me to spend time with books back then. LOL!). Let’s get straight to the point. 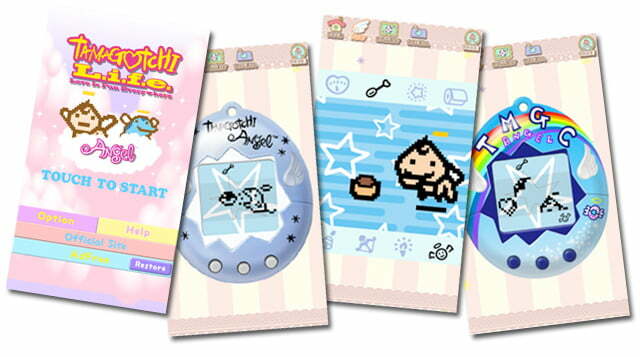 Your digital pet Tamagotchi is back! Now you can download and install the apps on your iPhone or any Android devices. The new Tamagotchi which recreates the original Tamagotchi Angel digital handheld game series, for iOS and Android devices, was launched in February 21, 2014. The latest Tamagotchi feature changeable play modes which allow the players to care for their Angels in the classic eggshell toy or full screen in device mode. Furthermore, the app offers a multiple Angel characters with some new color environments such as updated Life, Happiness, Hunger and Effort meters. Unlike the old Tamagotchi, the new app enables users to post photos of the Tamagotchis they’re raising on Facebook. For more information on the Tamagotchi L.i.f.e. brand and upcoming apps, please visit their Website at tamagotchilife.com. If you’re tired waiting for your Clash of Clans (COC) builders to complete with upgrading, just grab this cute Tamagotchi. Beware! Tama won’t stop calling you (sometimes I find it’s pretty annoying… LOL!). I’m off for now. See ya later! Have fun with your Tamagotchi! *All photos are taken from tamagotchilife.com.